Beauchamp Foot & Nail Laser Clinic specializes in chiropody and podiatry and offers a breakthrough toenail fungus laser treatment that effectively treats patients suffering from toenail fungus. The laser is a newly patented technology that kills toenail fungus with proven clinical results and no side effects. The toenail fungus laser treatment is non-invasive and requires no anesthesia or recovery time. During the toenail fungus laser treatment, a specially-designed laser beam is directed across the nail. 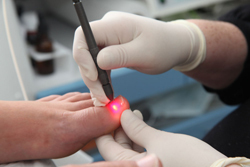 The laser penetrates the nail bed, targeting the fungi responsible for the infection, while leaving the nail and surrounding healthy tissue intact. The procedure takes about 30 to 60 minutes, with little or no discomfort. The toenail fungus laser treatment is usually done twice, with office visits scheduled four to six months apart. There are no visible changes in the nail at the time of treatment. Results vary depending on the severity of the toenail fungus. Patients can expect to see results within three to six months.